Let's face it. In the end, law school is a regional vocational school (even if your worldview looks like this). You will have to pass the bar exam for the state in which you want to practice, and a law school in that state is much more likely to prepare you for the specific content on which you'll be tested. Moreover, the majority of alumni usually stay near their alma maters, so the strongest network will be local, for local jobs. It's to your advantage to go to school where you want to practice, sometimes even more so than going to a higher-ranked school. Traditional law school rankings list rank programs nationally, with a few top schools at the top every year. Graduates from these schools are, one assumes, able to get jobs anywhere in the United States. This year, we heard from approximately 15,000 BigLaw associates about where they went to law school. And with our eye towards employability, we've ranked law schools based on the number of associates from different schools at BigLaw firms across the country. But what if you don't get into one of those all-around top schools? Or even if you do, do graduates from that T14 school get the top jobs in your area? National law school rankings such as those by U.S. News and The National Law Journal--or even our ranking above--don't take location into account. But location is a big factor for applicants, not only when thinking about jobs, but also when it comes to where they'll be happiest and have the most opportunities. As The Law Street Journal points out, it's important to ask, "Is the law school in a big city close to courts, government agencies, and large firms? Have [sic] to drive a long distance to your second round interview or to your summer internship can be a hassle." The importance of location is apparent at all three location levels: city, state and region. Wherever you want to work, it's valuable to see where the majority of their lawyers come from. If you want to work in New York City, for example, a degree from the Fordham University School of Law (U.S. News No. 34) or Brooklyn Law School (U.S. News No. 67) is very popular; however, if you want to work in D.C. or Chicago, they're much less so. Of course, there are the T14 law schools that will have alumni networks in most major cities (e.g., University of Michigan Law School (No. 5 on our Top 10 national list) has the largest scope, making the Top 5 lists in Chicago, Miami and the Pacific Northwest--literally coast to coast), but if you know where you want to work after graduation you will be better able to tailor your school list, knowing which tier two (or three) schools feed that particular location. It's been said that in the current economic climate, lower tiered law schools aren't worth the investment. Due to the decrease in number of available first-year associate positions nationwide, law firms are becoming more selective and recruiting at fewer schools. Which creates a trend towards prestige: why recruit at a lesser school when there will be available students at a top school? As David Van Zandt, Dean of Northwestern University Law School, told The Chicago Tribune, "It doesn't make a lot of sense to go to law school unless you go to a pretty good one." However, as you can see in our regional rankings, the meaning of "a pretty good one" differs from location to location. So a "pretty good" law school from which you're more likely to get a job can vary widely from city to city, region to region or state to state. The most striking example of the importance of location--and the spectrum of "pretty good" law schools therein--is Texas. 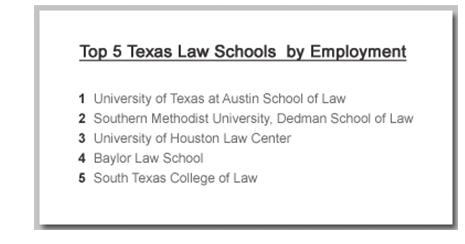 All Top 5 Texas Law Schools by Employment in are in the state, with little regard for national rank. The University of Texas at Austin School of Law is No. 1, which is no surprise since it's at the state's flagship university, but No. 5 is the South Texas College of Law--a tier four law school (at least according to U.S. News). It's clear that if you want to work in Texas, going to Harvard, Yale or Stanford probably won't help you as much as UT Austin. Moreover, attending a local school that's ranked lower nationally will likely be much cheaper, leaving you with less student loan debt. 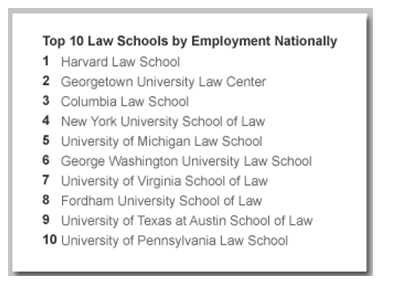 While these Top 5 lists illustrate the employment numbers of law graduates from different schools and thus where they have the best job opportunities, they do not reflect the quality of those graduates (i.e., which law schools actually graduate the most employable lawyers). For an actual employability ranking, check out Vault's Top 25 Law School Ranking, for which law firm recruiters and other interviewers, hiring partners and committee members rated each law school's graduates based on "research and writing skills; knowledge of legal doctrine; possession of other relevant knowledge (e.g., science for IP lawyers); and ability to manage a calendar and work with an assistant." Oddly (or perhaps not at all), the most employed and most employable law school rankings don't match up. Stanford Law School tops the employable ranking, while Harvard Law School tops the most employed. For me, the only way I can reconcile these two lists is to accept the many different reasons for which someone is hired--networking and location not least among them.